If you would like to check-in or check-out before or after the above times, please contact us in advance. Note that we may not be in office in the daytime. If you delay your check-in time, please inform us in advance. If we don’t receive any notice in advance regarding your delay, we will cancel your booking. 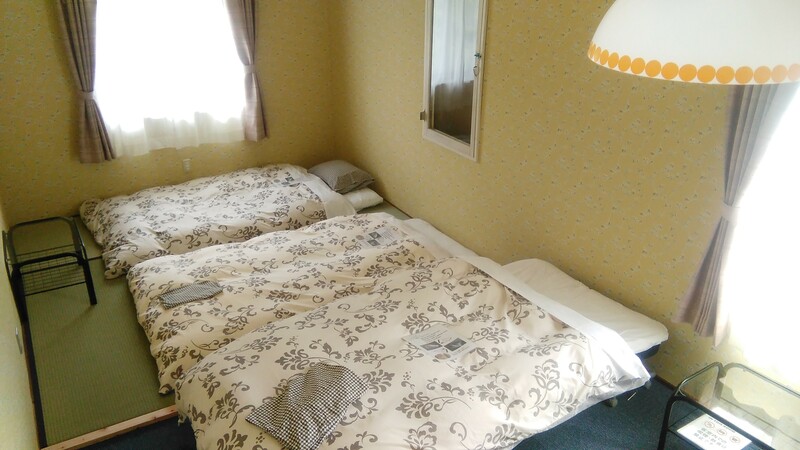 Daisen Backpackers’ guest rooms are 8 in number, consisting of three types: Twin Room, Triple Room (for 3 guests), and Family Room (for 4 guests). We can accommodate up to 19 guests in total. No drinking or eating is allowed in bedrooms due to hygiene reasons. Please use the living room on the 1st floor for drinking and eating. As the building is of wooden structure, it is not highly soundproof. Please keep quiet during the night (after 10:00pm). For bed-making, please bring your used bed linen (two sheets and a pillowcase) to the front desk (1st floor) on check-out. Please use the Living Room to drink and eat. No drinking or eating is allowed in guest rooms. The kitchen is equipped with basic seasoning ingredients and cooking utensils. Feel free to use them anytime. Please wash your dishes and utensils after each meal and put everything back in its place. We have a few drinks for sale such as mineral water and beer. We have three sinks on the 2nd floor and one on the 1st floor beside the staircase. Dryers are placed near the sinks. The bathrooms are shared and located on the first floor. During the high season, please be mindful of time and others in need of use. Shampoo, hair conditioner and soap are placed in the bathroom for your use. If you would like to fill a bathtub with hot water (\300/once), please inquire at the front desk. Showers are free of charge. Toilets are shared and are on the 1st and 2nd floors. The toilet on the 1st floor is shared (for men and women), but men’s and women’s toilets can be found on the 2nd floor. The laundry room is on the 1st floor with a washing machine. Please use the washing machine between 7:00am and 9:00pm. The cost for using the washing machine is \100 for each time (laundry detergent included). We have no drying machines, but you can hang your laundry in the laundry room. Free parking is available at Daisen Backpackers. During the high season or when the parking lot is full, we can arrange for you to park at a different place.